This month, Ethiopian officials shut down five magazines -- the latest in a series of shutdowns -- but the move got little attention from outside the country. The East African country is well known for suppressing the media, but some cases seem to get celebrity status while others are ignored. Twelve Ethiopian journalists and publishers left the country in August after the magazines they worked for were forced by the government to shut down. International media gave little attention to the self-chosen exile of these media practitioners. In contrast, the cases of Eskinder Nega, Reeyot Alemu and more recently the Zone9 bloggers have been covered by outlets such as al-Jazeera and the BBC, as well as VOA. Tom Rhodes of the Committee to Protect Journalists, or CPJ, says it can be partly explained why some cases get more attention. “In the case of the Zone9 bloggers and Eskinder, they were quite well known in the diaspora, the Ethiopian diaspora, and had a lot of international contacts and backers. While other cases unfortunately are not so well known. I think of Solomon Kebede for example who is still waiting for trial," he said. Forty-one human rights organizations such as Amnesty International and CPJ released a joint statement calling for the release of the Zone9 bloggers and journalists, who are charged with terrorism. Amaha Mekonnen, lawyer for the Zone9 bloggers and journalists, said there was a small chance the international attention would have an impact. "As we have the experience, there may be a chance to settle the matter out of court, in which case, this information, all deliberations and analysis the case of this bloggers and journalist may be used to speed up and finally get a successful results," said Mekonnen. Both Eskinder Nega and Reeyot Alemu have been detained under Ethiopia's controversial Anti-Terrorism Proclamation. Human rights group said the 2009 law was overly vague and allowed authorities to arrest anyone who criticized or opposed the government. 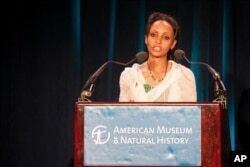 Serkalem Fasil accepts the 2012 PEN American's "Freedom to Write Award" for her husband Eskinder Nega, imprisoned Ethiopian writer, in New York, May 1, 2012. Eskinder won the 2012 PEN American's Freedom to Write Award while serving an 18-year prison sentence and Reeyot won the UNESCO World Press Freedom Award in 2013 while serving an ongoing five-year prison term. Reeyot is not allowed to see anyone else besides her parents, for 20 minutes a day. “The international media is also encouraging the family of Reeyot, and Reeyot herself. The international media coverage disclosing her strength on freedom of speech or freedom of press, and by that way she was awarded, I think, international prizes. In that case we are very delighted,” he said. There was always a worry when giving exposure to a case, said Rhodes of CPJ. But he also believed that it was crucial to inform people about what was going on. Ethiopia ranks 143 out of 180 countries on the most recent World Press Freedom index. A 2014 Human Rights Watch report says Ethiopia is one of the three top countries in the world in terms of the number of exiled journalists. The trial of the Zone 9 bloggers and journalists will resume October 15.